We are going to start this chapter with birthday. ​Remember when Bao kept shouting "I'm not insane!" when the scandalous picture in the newspaper was published? Well, it happens that Bao is insane now. He randomly rolled that trait on his young adult birthday. Poor boy. He often talks to himself and forgets to take a shower, but oterwise is harmless. Even his brother Batyr is all cool about it. Nothing has triggered his angry moods lately, he's been such a happy sim that he's becoming my favourite. Who could resist that cute puppy face? Plus he enjoys staying in his underwear the whole day. Bao has made a new friend - Jason Huntington - who doesn't mind his insanity and is also a geek. They talk a lot about their favourite tv shows and captains. Batyr spinned into YA, rolling bookworm trait in the process. He's now hot-headed clumsy bookworm. I hope he's not going to destroy many books. :) Bao cheered for him like a good brother, while his sister and parents were... elsewhere. Oh, I remember now where Babs was. She was taking a pregnancy test. Which came out positive. Oh dear. Babs decided to pamper herself during this pregnancy. She invited a masseur and enjoyed a long foot massage in a newly built basement. This baby is gonna be the last, she thought to herself. Four kids is plenty to keep the legacy alive. One day Bao sought out his father to discuss something important with him. ​"Dad, I'd like to move out." "You can't move out, Bao, the heir hasn't been decided yet." Bao took a deep breath. "I can't and don't want to be the heir." "And why is that?" asked his father surprised. "Does it have to do something with your insane trait?" "That too, dad, but... here's the thing... I'm gay. And since our succession laws are very strict about the heir being from the Founder's bloodline and not adopted, I'm out of question as the heir." "I see," his father only said before adding: "I'm glad you told me, Bao. I can't make you stay, if you want to move out, but let me tell you something. When you were born, I started building a house for you and your future family. I want you to move into that house a live there with the person you love, no matter if it's she or he. You are my son and I love you and don't want you to move far from your family." Bao was touched by his words and couldn't speak without starting to cry. He just hugged his father and nodded. He'll proudly live in the house his father build for him. Bao asked his boyfriend Jason to move in with him and Jason gladly accepted. He had no regrets about leaving the legacy. He felt more free now. It wasn't long before he mustered the courage to propose to Jason. He said yes and they eloped shortly after. Meanwhile it was time for Babs to give birth. She quietly took a cab and went to the hospital on her own. And then the game screwed me over, because Babs gave birth to triplets. Yes, you read me correctly. TRIPLETS! I thought having already a big family in the house will prevent twins or triplets to be born. And how often you have triplets anyway? I was looking forward a nice baby girl or boy and I got three... boys instead. PLUM! Meet Bradley, Brian and Bernd. We definitely need to move to the next letter in alphabet soon. In all this mess I completely forgot about Beryl's young adult birthday. I can't believe it! The only girl in the whole legacy so far and I forgot. Things are getting out of my hands, clearly. At least she could channel her sadness from being completely forgotten into piano practice. She's lvl 8 pianist now. Must mean something. With the birth of... babies, Andrew started building the last house of lower class neighbourhood. 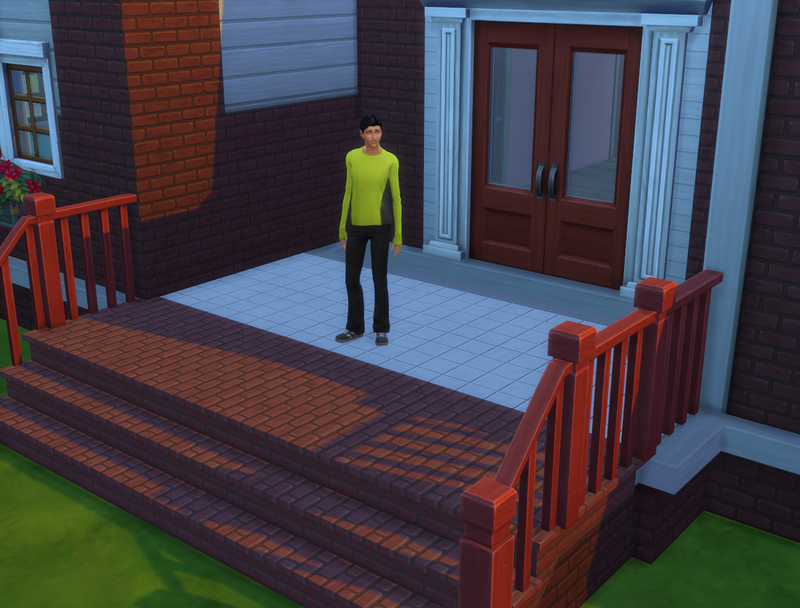 With this house he completed this generation's goal and needs to finish his aspiration yet. Which is pretty damn hard. He needs 4 grandchildren. I have no idea how I am supposed to squeeze them in the house. No idea, really. And I can't move the 3rd generation out yet either, since we don't know the heir yet. I guess I'll have to break a few rules here. :) Like moving out Batyr and Beryl and in case one of them wins the vote, I'll move him back. This is going to be interesting,. Batyr's love life is progressing nicely. While his sister Beryl spends most of her time playing the piano, Batyr walks in the community park and meets new people. Like this sweet girl - Aliyah Traviss. Batyr seems to be the most probable candidate for producing the first grandchild for Andrew's aspiration. He even offered a hand massage to his dear friend. Ain't that just sweet? To tell the truth he wasn't very good in in. Aliyah often grimaced, because he squeezed her hand too much, but it's the effort what counts, right? Check that dreamy look on her face. Batyr: You have such a lovely face, Aliyah. Would you mind me taking couple of pictures of you? Batyr also helped a lot with the triplets being a good son and brother. But even he needed some quality time out of the house. That's why he accepted his cousin's offer to come over for a party the following Friday, which was also the day when Babs's old friend was getting married. Batyr expected it would be up to him to babysit again, but Andrew suggested Beryl could do that this time. She had no plans for the day anyway, except practicing the piano again. And so it happened that Beryl had the whole house to herself on Friday. If you don't count three little crying babies. Beryl fed them, changed them and put all three of them to sleep successfully. Then she watched tv (finally she could watch her favourite show without fighting over the remote). At usual time she let in the, maid who was angry for no reason this time. Beryl happily stayed out of her way. She played piano a little and then took a nap. Before she woke up her parents came back home from the wedding afterparty. They were in pretty flirty mood too. Babs went to check on her little babies right away. She missed them so much. Andrew started repairing the tv that has broken again. But when Babs leaned forward to hold her third baby, she froze. She called out Beryl to ask her if she had the baby with her, but she already knew in that moment that something terrible had happened. "Where's my baby? Where's Brian?" she yelled at her daughter, before she collapsed.